Chinese artist Fu Xiaotong has a strong affinity with handmade Xuan paper, which has been used within China since the Tang dynasty and is still preferred by traditional brush and ink painters and calligraphers. Focusing on the Xuan paper as a material, Fu thinks paint and ink usually covers the beauty of the paper. 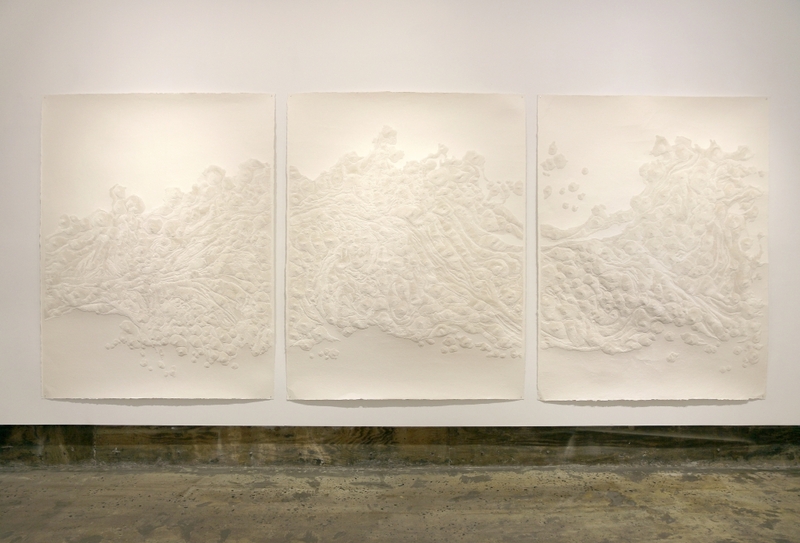 Taking a unique approach, she uses paper as the medium and uses needles to pierce holes to form images. From June 7th to August 18th, a series of Fu’s most recent works are on display at Chambers Fine art gallery in Chelsea, bringing to New York audiences a new way to appreciate the beauty hidden within Xuan paper. Having investigated pinprick techniques for a while, Fu Xiaotong developed a language of the needle consisting of five ways of approaching the surface of the paper to generate different textures and contours. For her latest series, she pushed the techniques even further – she now starts from the center and works in a circular rhythm, softening the sturdy paper until it results in a three dimensional surface. The evolution in her technique also resulted in different images. Rather than only constructing pre-determined landscape motifs such as rocks or streams, Fu has worked more intuitively to create imagery that is abstract and organic.